While the Galaxy S10 family is not exactly the world’s best-kept secret, Samsung has largely managed to avoid high-quality leaks of real-life prototypes, which is quite an achievement given the company’s next-gen flagship smartphones are essentially confirmed for a February 20 announcement. Of course, thanks to the generally reliable @OnLeaks and our own rock-solid inside sources, we know what to expect from the Galaxy S10 and S10+ in terms of general design language and specific screen cutout implementation. 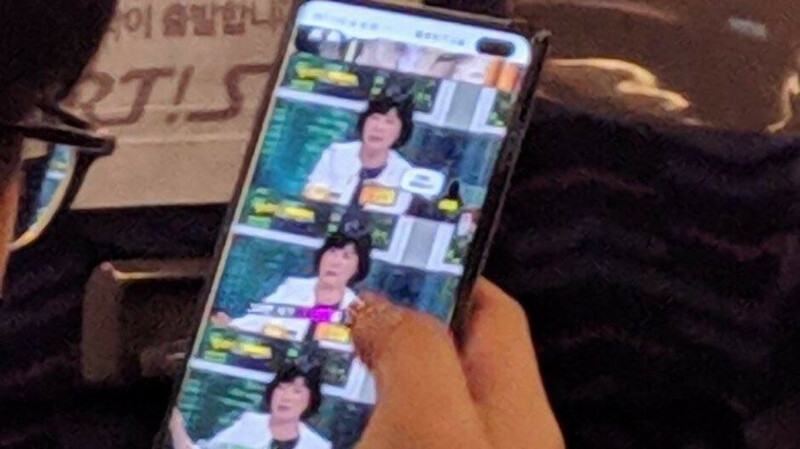 Meanwhile, Evan Blass recently offered our first glimpse of a “regular” Samsung Galaxy S10 variant in the wild, and now a live picture of a purported pre-release Galaxy S10+ unit is making the rounds on Reddit. Unfortunately, the photograph takes potato quality to a whole new level, making it impossible to distinguish any subtle details that may have helped further build hype for Samsung’s next big thing. We can’t even be 100 percent certain this is indeed the unreleased Galaxy S10 Plus, although the main easily discernible feature is a dual front-facing camera housed in a large, pill-shaped display hole that falls in line with our expectations and all those leaked renders so far. In all likelihood, the picture depicts a Samsung employee gone rogue, bound to be harshly penalized for his carelessness. Even though the no doubt advanced prototype is disguised with the help of a special case, the screen and user interface were probably supposed to be camouflaged as well. At the very least, the phone should have never been used in public. Then again, it can’t be long now until every single detail about all four models will be essentially etched in stone. On that note, a Redditor claiming to be in possession of a similarly masked and unpolished Galaxy S10+ pre-release version compares the handset favorably to the Galaxy Note 9. The GS10+ allegedly feels lighter, despite being "about the same size", while the One UI software is "pretty darn fast." More importantly, the phone's in-display fingerprint recognition technology is "confirmed" by this source as well, along with improved facial authentication. The iris scanner is indeed apparently out, while other features remain under wraps as this purported Samsung employee doesn't want to get into trouble for revealing too much too early. Wow that bezel! I'm so excited for this beast! Damn, February 20 is still more than a month away! Camera cutout looks like an eyesore but hope the phone turns out great. Ewwww, this looks so disturbing. Bigger than a small hole looks like a thick marker trace on the screen. Actually an eye sore. And like the notch is not a eye sore, right. I will take this over a ugly notch. Still not a fan of the cutout but far ahead of the unibrow for sure. The cut out to be honest is an eyesore. And look at all the apple trolls. @Raito Duh, you're in a samsung article so it's natural samsung users will be here. Notch is also ugly but you don't see people bashing notch buyers in real life. I may or may not like the cut-out, I am saving the full judgement when I have it in my hands just as I said that notch is ugly when I saw the actual iphone x. Design looks great. No issues on the camera cutout. Ugh. That camera cutout not so good. Should of went with small notch. Everyone will get used to the cutout. I have a product red iPhone 7 with the white front with the top and bottom bezels, the visible black camera lens on the front isn’t centred either (it’s to the left of the ear speaker) but I never even notice it. Sure this S10+ cutout is within the screen and a little bigger but then so is the display overall. Samsung have obviously done their research and are happy having the cutout not centred is fine. Although I still prefer the slider designs of the Find X and upcoming OnePlus. 100% screen is the way forward, thankfully the Notch will be dead by 2020. Love how you speak for everyone here. No....not everyone is going to get used to that ugly and unnecessary eyesore. I for one will not purchase any phone with screen compromises. Just waiting for this dumb trend to be over. Hopefully Samsung uses that new infinity screen by the time the Note 10 comes around. I wish they would have went the slide out also or just super thin bezels. But this is still better than the notch. Still much smaller than most notches out there. This kind a floating black spot on the screen is real eyesore. With notches it's end of the screen so it kind a blends with the screen and bezels. with this you still have screen up and right side of cutout too which make it very distracting. It's kind like a dirt which you can't wipe away. Samsung already made notch hair cut for their ad so now they can do like a mole on forehead ad. LMFAO How the hell does the notch blend in, lol It stands out just as much or more. Things look completely different when you're delusional apparently. But he only comments on Apple articles, really!